Identify the people you can help. As a park ranger, it was easy to identify this lady needed help, but what if my approach would have been just to show up at every campsite and ask if they needed help with something? What are the chances a burly guy in flannel would have needed the park ranger’s help to start a campfire? It would have been a waste of my time, and I would have probably missed the opportunity to get in front of the person who really needed help. You are only a piece of the customer’s story. The park ranger who saved the day was only a small piece of her adventure. The real story is her first camping trip since her husband died. Perhaps without the park ranger, she would have given up and went home, but all I did as the ranger was provide her with a solution so she could have her adventure. 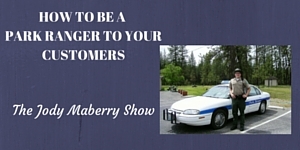 You need to understand you are a piece of your customers story. Find a way to explain how what you do will help them live out their adventure and create their own story in some way. I spent only 20 minutes with the lady. You have to make your 20 minutes count.